These are the proceedings of the third biennial Frank N. Bash Symposium. Since the first "BashFest" held in honor of Professor Frank N. Bash at his retirement in 2005, this symposium has brought together excellent young researchers from around the world who are working on frontier topics in astronomy and astrophysics to exchange research ideas, experiences, and their visions for the future. The symposium centered around invited review talks by thirteen postdoctoral researchers covering the vast range of modern astronomical research, from detection of extrasolar planets, to dynamics of stars in the Milky Way and neighboring galaxies, to galaxy formation in the early Universe, to theories and observations of dark matter in our Cosmos, and to promising probes of cosmology including Gamma-Ray burst, Lyman-alpha emission, Cosmic Microwave Background radiation, long baseline optical and near-IR radiation, and redshifted 21cm line observations. Poster contributions from undergraduate, graduate students, and postdoctoral researchers also covered a wide variety of topics, including stellar abundances, galaxy formation and evolution, multi-wavelength observations, and theoretical studies of supernovae and the early Universe. 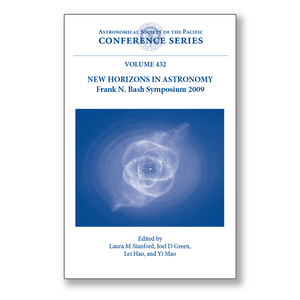 These proceedings are suitable for young and experienced researchers alike who wish to view a snapshot of a wide range of astronomical topics as seen through the eyes of emerging scientists and framed by their vision of the future of the science of astronomy.